With their golden era long behind them, legendary movie icons Laurel & Hardy (Steve Coogan and John C. Reilly) embark on a variety hall tour of Britain and Ireland. Despite the pressures of a hectic schedule and with the support of their wives Lucille (Shirley Henderson) and Ida (Nina Arianda), their love of performing, as well as for each other, endures as they secure their place in the hearts of their adoring public. Midway through Jon S. Baird’s Stan and Ollie I realised two things. One, I had completely forgotten that I was actually watching Steve Coogan and John C. Reilly and not Stan Laurel and Oliver Hardy. Both performances are superb - utterly, often uncannily convincing (Reilly’s prosthetics are incredible). The second thing I realised was that, for most of that time, I had watched with a huge smile on my face. This film is both genuinely funny and incredibly charming. It is a joy to see the pair perform their hilarious skits and also come up with brilliant new material during the time they spend on tour together. Stan and Ollie is not content to bring us just one comedy double act, however. This movie has two. As their “come back” journey takes them to London, the duo are joined by their wives Lucille and Ida. Shirley Henderson and Nina Arianda are wonderful - both give wonderful, scene stealing performances. It is worth noting that Baird’s film is far from just a series of entertaining Laurel & Hardy reenactments. 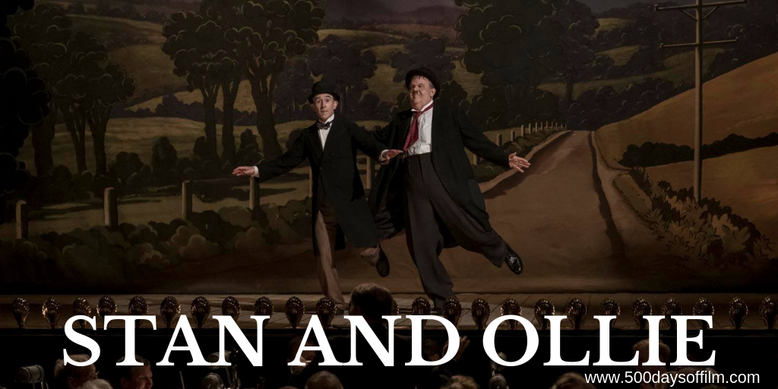 What gives Stan and Ollie satisfying emotional weight and significance is the poignancy that runs throughout the film. Despite achieving incredible success, the pair find themselves in desperate need of money and unable to convince the film or theatre industry that they are still worth the investment. A troubled past and this uncertain future puts a strain on the partnership - one made worse by Hardy’s worsening health. Their response to this struggle moves through various stages - polite denial, resentment, anger - culminating in an emotional recognition of the role each has played in the other’s life. It is incredibly moving. As a result, by the end of Stan and Ollie, more than a few tears accompanied my smile. Have you seen Stan and Ollie?